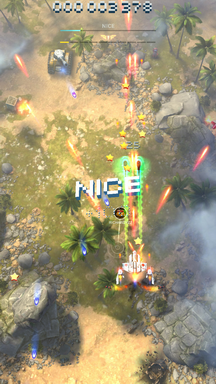 Quite a while ago I had fun playing through Sky Force 2014. 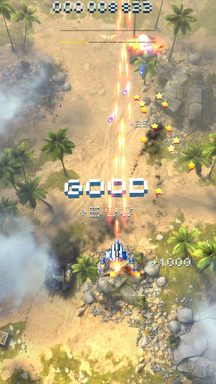 I decided to redownload it and play it again for a while, but to my pleasant surprise, I noticed that the developers had recently released a new, updated version Sky Force Reloaded. Much of the game seems to be quite similar to the earlier version, however, one major difference is that you can collect ship parts and once you've collected all parts for a specific ship, it is unlocked and you can select it for play. Although I have no way to specifically farm a particular ship, I am still curious, what are all of the available ships and what are their buff/debuff stats? The planes have been finally complete in the latest update. Model 2004 a.k.a The Classic : your original red ship. Laser whip will replace main cannon after receiving the 'score bonus + new weapon for the classic' card. No more retro mode. Swift Justice: -50% health, speed +10%. It has the narrowest cannon coverage (focused shots). Ambulance: increase rescue speed, low health. It has the widest cannon coverage (3-way shots). I only unlocked 3 so far. If I am not wrong, you can only get parts of a certain ship from certain stages? At least that is how its going on me with unlocking ships. Got drops at easy difficulty levels. Not the answer you're looking for? Browse other questions tagged sky-force-2014 sky-force-reloaded or ask your own question.